Rural Revolution: "Twin beacons of faith and freedom..."
It makes me just want to cry, grieving over what this country has lost. "There isn't a measurement known to mankind that﻿ is big enough to describe how much better Ronald Reagan was than our president now is." Ronald Reagan was truly a great president. I don't see another Reagan anywhere around, which is very sad and very scary. Prep, people, prep - we're being sold down the river by the current administration. Heck, Congressmen were told not to wish Merry Christmas in their letters to constituents. How low have we sunk? Truly sad and scary. I just shared this message with my family. How far we've come in 30 years in the name of "progress and political correctness." 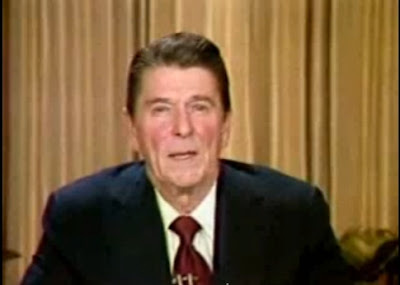 You might want to watch the Christmas address from the Obamas, which has every bit as much "Christmas" as this Reagan video. The White House has so many Christmas trees it looks like a holiday special of the the show "Hoarders." Some of us miss Christmas before it was claimed by rageaholics. What an awesome Christmas message. I miss Ronald Reagan. I miss America. One went to Heaven. One went to Hell.